and the best format to chose really depends on the intended use of the drive. If the flash drive needs to be used on a Windows PC as well, then MS-DOS FAT32 File System is the one and only option available. The same is true for UNIX, which makes UNIX-FS the obvious, best choice. But how do all these formats compare and which one should be used, if Macs running OS X are the only computers the Flash-Drive will ever be used with? Mac OS Extended a.k.a. HFS Plus a.k.a. HFS+ seems to have a lot of advantages over MAC OS Standard a.k.a HFS. Mac OS Extended format is a hard disk format that increases the number of allocation blocks on the disk and also allows more than 65,000 files on the hard disk. However, Mac OS Extended format optimizes the storage capacity of large hard disks by decreasing the minimum size of a single file. MAC OS Standard a.k.a HFS on the other hand does not support file names > 31 chars, it does not support additional meta-information used by Mac OS X, has as limit of 65k allocation blocks, and is more error-prone than HFS+. Since the storage efficiency of Mac OS Extended format typically applies to 1 GB or larger volumes, Flash Drives with a capacity below 1 GB may still benefit from the MAC OS Standard format. If journaling is turned on for a disk, Mac OS X maintains a continuous record of changes to files on the disk. If your computer stops because of a power failure or some other issue, Mac OS X uses the journal to recover the hard disk to the last acceptable state before it stopped. However, flash memory has a limit when it comes to how often a memory location can be changed and therefore, Journaling doesn’t seem to be the first choice when it comes to Flash-Drives. 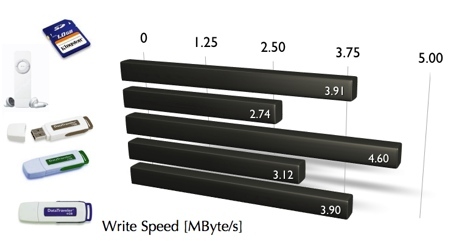 Storage Efficiency and Write Speed. Considering Storage Efficiency, MS-DOS File System is the clear winner. Not only does the Flash-Drive when formatted in MS-DOS FS provide the biggest storage capacity (960.5 MByte), the stored files also occupy the least amount of storage space (581.2 MByte). However, writing the 203 smaller files took over a minute on the MS-DOS formatted drive, a task that was performed in less then 5 seconds on any other format. The UNIX file system performed worse when we looked at the transfer speed for larger files (2.45 MByte/s). MS-DOS was with 4.35 MByte/s close to the transfer speed winner, Mac OS Standard: 4.62 MByte/s. Since I’m going to use the Flash Drive only on a Mac, my favorite format for the Flash Drive is going to be Mac OS Extended (Case-sensitive). Now that the formatting question has been resolved, let’s have a brief look at how the different Flash Memories perform that I can find around the house. Not unexpectedly, the lowest capacity DataTraveler performed the best. The iPod Shuffle’s slow write speed on the other hand was a little surprising. 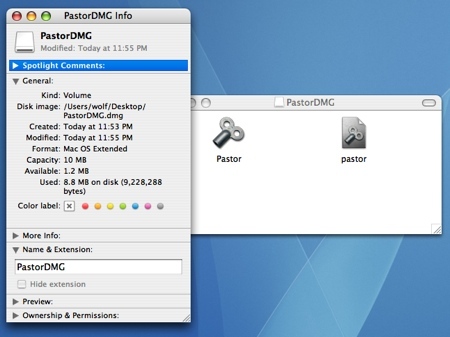 Fortunately, Pastor, the Password storage tool, requires fully deployed only 8.6 MByte storage. 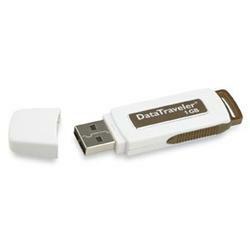 The password file is tiny and therefore, the 1 GB DataTraveler will work just fine. After opening the secure dmg the application and data-file can be added by simply dragging the files into the drive. Ejecting the drive will unmount it and every future attmept to mount / access the disk image will require to enter the prevously specified password.